This morning started overcast and dull at the main offices in Lincolnshire, however, as Ralph and I travelled back to Essex the weather brightened and the sun came out. One of the good things about travelling about the country is enjoying the views, sometimes even places that you have travelled past many times can look different when the light is right. This morning the light and the colour of the sky were superb. It was just right for taking pictures so I snapped away through the van window whilst Ralph was driving. I was using the camera on my new phone and I am really impressed with the quality, the details on these silos and church belfry stood out really well. The colours on the brick church at Ford End reflected the Autumn shades and really stood out against the sky. And finally the lone Pine, it really was a lovely journey this morning. The last couple of weeks have been very exciting and busy. The concrete base for the new warehouse was in at the beginning of November and we were waiting for the construction to begin. We knew that timings were going to be tight. The weather was unfortunately not helping as it was decidedly damp, well, actually raining, when the building and constructors arrived on the Monday. Our next delivery was due that week too and we wanted to put some of the stock straight into the new building. The building was watertight by the end of Wednesday and we got a dehumidifier and space heater in there straight away to dry it out ready for the delivery the next day. The delivery included the new 24” wheel version of our popular Diamond step through electric bike. This is a scaled down version of the bike, which is brilliant for the shorter rider. We were able to announce this straight away on the website. 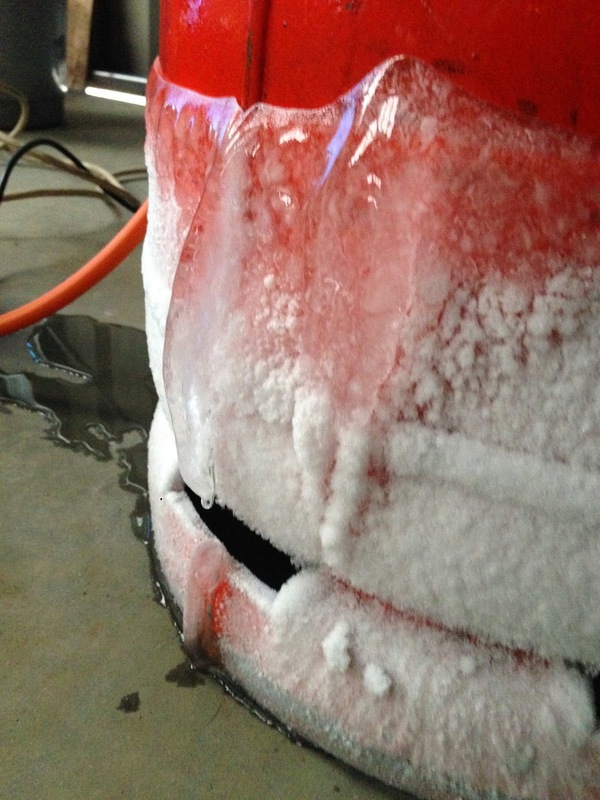 The gas for the space heater had been working very hard overnight to dry out the warehouse. The announcement of the 24” Diamond was closely followed by the news of the brand new Batribike model, the Storm. The Storm is a full suspension MTB style electric bike that will be hand built in our new assembly area in the old warehouse. The Storm will be available in the Spring. It really has been an exciting couple of weeks. 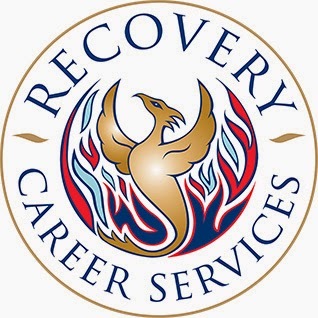 Early in the year through a contact at Help for Heroes we were put in touch with the Recovery Career Services. This is an organisation that helps wounded, injured and sick Armed Forces personnel to find a new, fulfilling career that meets their own individual needs, and assists them in moving on with their lives. Leaving the Armed Forces can be a challenging prospect, but leaving when the decision has been forced upon you due to serious illness or injury can present a far greater challenge. Batribike has been a partner organisation to Recovery Career Services since early in 2014. 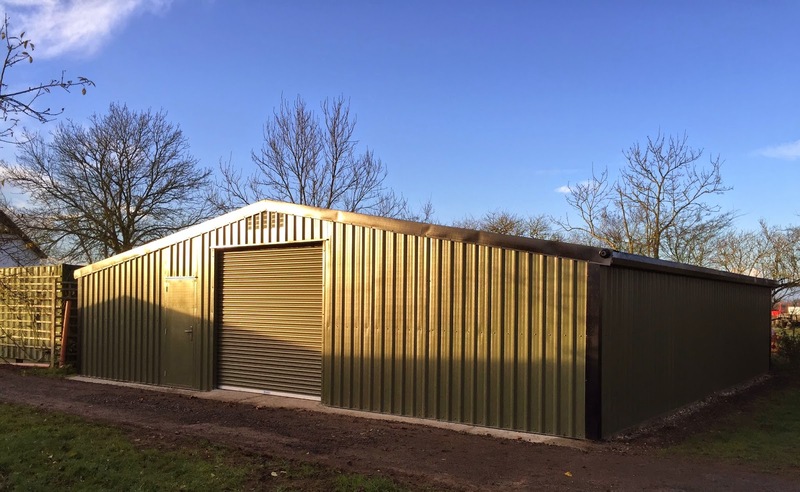 Batribike is delighted that we have been able to offer Armed Forces personnel the opportunity to experience working with a small team across many areas of the family run business. Obviously we cannot go into detail but one young man has already spent time in our workshops learning about bicycle maintenance and how an electric bike works. We wish him well for the future. Batribike electric bikes stockist Top Gear Ltd is based at the in the southwestern most corner of England. The showroom is located at Penryn, close to Falmouth, where customers can test ride a range of Batribike models. Top Gear’s website, Cornwall electric bikes, gives details of special open days and other events. 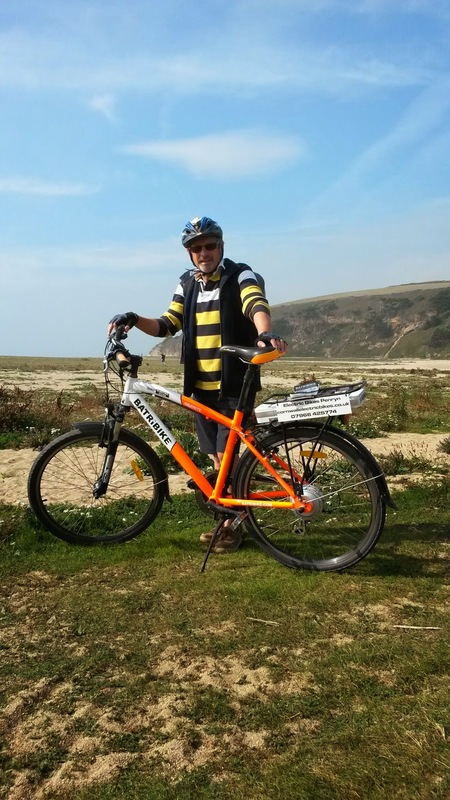 Owner Peter Williams not only promotes the concept of electric bikes but also enjoys riding them. The area’s outstanding scenery makes it easy to understand why so many people take advantage of two-wheeled transport to connect with the views. Locally there are many lovely cycle routes; the Devoran to Portreath coast-to-coast trail is probably the best known. 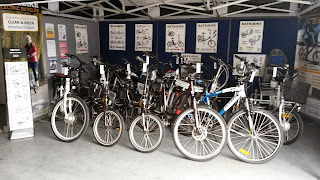 The trail passes Elm Farm Bike Hire Centre where a Batribike electric bike is based. From here riders can easily assess the benefits of electric motor assistance and enjoy the feeling of freedom that cycling can bring. Top Gear special offer – For anyone who hires a Batribike Diamond at the Elm Farm Bike Hire Centre and then decides to purchase. Top Gear will reimburse you the cost of rental for one day against the full cost of a new bike. At Batribike HQ we are gearing up for the delivery of our new 24" step-through electric bike. The new bike has been developed in recognition of the need for a stylish bike with a traditional look for the shorter rider. To accommodate the new bikes we are expanding our warehousing space. The exciting news is that the concrete base is in and we are awaiting the construction of the new building. This afternoon the early fog had cleared away to leave blue sky and sunshine so I nipped out to take some pics of how things are progressing. If you look closely you will see that we did have some assistance with laying the concrete edge which links the main slab to the access road! Watch the website for information on the new bikes once they have arrived. We had a very exciting day at the Motorhome and Caravan Show yesterday. We are at the NEC in Birmingham all week and have been very busy talking to lots of showgoers about the Batribike range of electric bikes and demonstrating the Cykell tow-ball mounted bike carrier. Yesterday at the end of the show the Caravan Channel were on our stand filming all about folding electric bikes and featuring the new Dash Pro. Presenter John Wickersham was very excited about folding electric bikes and had several questions for Sue on how they worked. We are looking forward to seeing the programme when it airs which we think will be on Monday 27th October at 8.00pm. The Caravan Channel is on Sky 192 or Freesat 402. 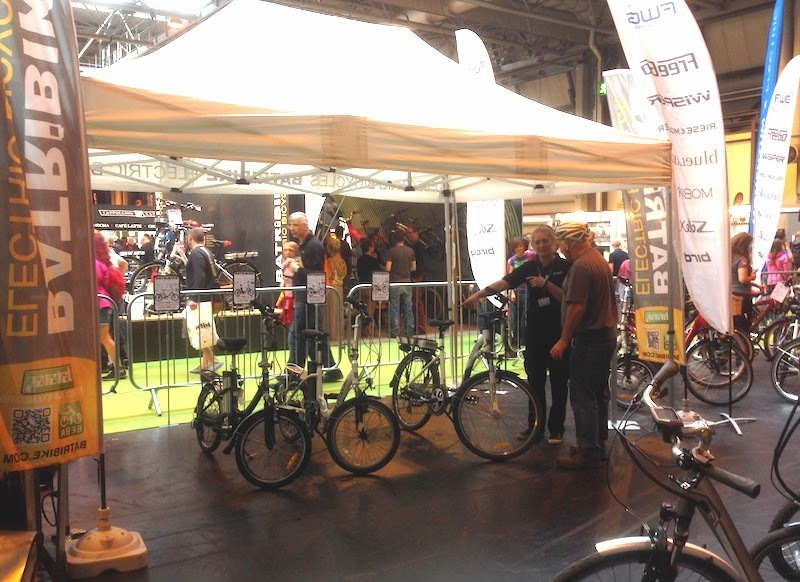 Getting organised for the Cycle Show at the NEC had kept us busy for some time. This year we had taken a bigger stand and therefore our display needed to be bigger. With everything ready we trekked off to the NEC in Birmingham with two fully loaded vans. I am delighted that everything went together well and the stand looked very smart. We had extra seating and a table this year which gave us a chance to sit down and chat with our visitors. The electric bike test ride area was laid out slightly differently this year and we were able to have our gazebo just across the aisle from our stand. We had five bikes in the test ride area where Ralph and Debbie were able to set riders off around the test track. There was a nice hill too, which was optional. Considering the size of the test track the mileages on the bikes were impressive. The Breeze we can only estimate as it has no means of recording distance, but we are estimating 40 miles. The Dash was 41.4 miles and the Dash Pro 48.6. The Diamond Pro achieved 47.1 and the Granite Pro was most popular at 52.2 miles. This gives a total for the four days of 236.6 miles! This is an amazing 100 miles more than last year. We talked to lots of people over the four days, from existing dealers to potential dealers and existing customers to potential customers. It was lovely to hear everyone’s stories and enthusiasm for our electric bikes. Thank you to everyone who came to see us. Datatag were at the show with their own stand explaining how the system is very effective as a theft deterrent. 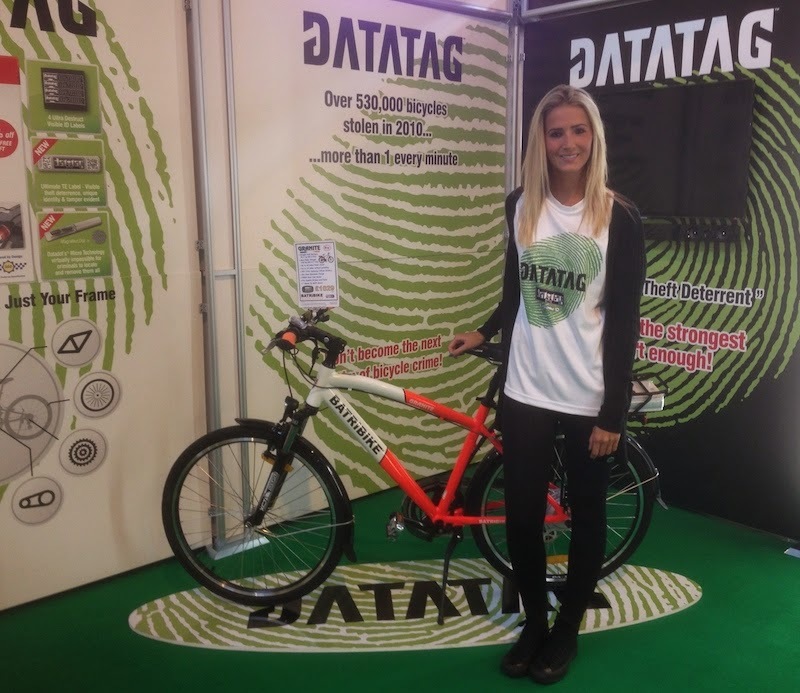 Batribike electric bicycles and electric trikes all come with Datatag fitted as standard. The orange Granite Pro featured on the data tag stand. The Cykell tow-ball mounted bike carrier had a huge amount of attention too. We have an excellent display stand that has a tow-ball on it so that we can demonstrate exactly how the system works. The advertising panel on the stand shows the rack mounted on a roller coaster - it really is that secure! Everybody that saw it was impressed by it’s quality and ease of use. I am sure it will be THE name in cycle carriers in the near future. Now we have a short time to recover before we are back at the NEC for the Motorhome and Caravan Show in less than two weeks time. Yesterday evening the National Lottery Stars programme on the BBC awarded accolades to several remarkable projects across the UK. One of the awards was for an environmental project. The award was won by the Helix Park in Scotland. 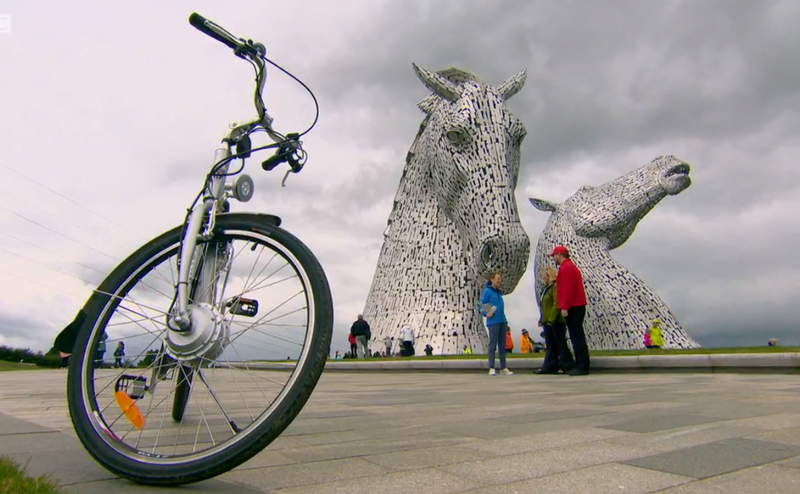 The Helix is a brand new public space created to link Falkirk to Grangemouth with miles of foot and cycle paths. 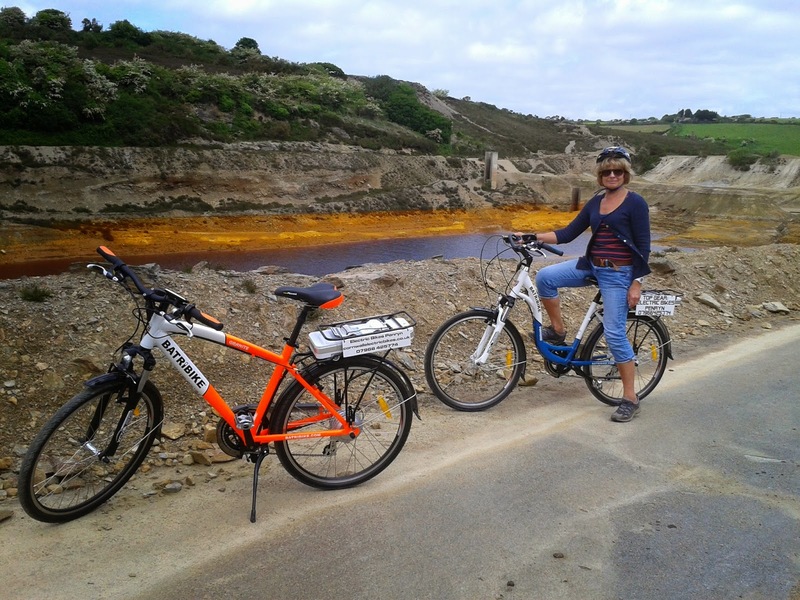 Batribike dealer Easygo Electric Bikes runs an electric bike hire throughout the region. 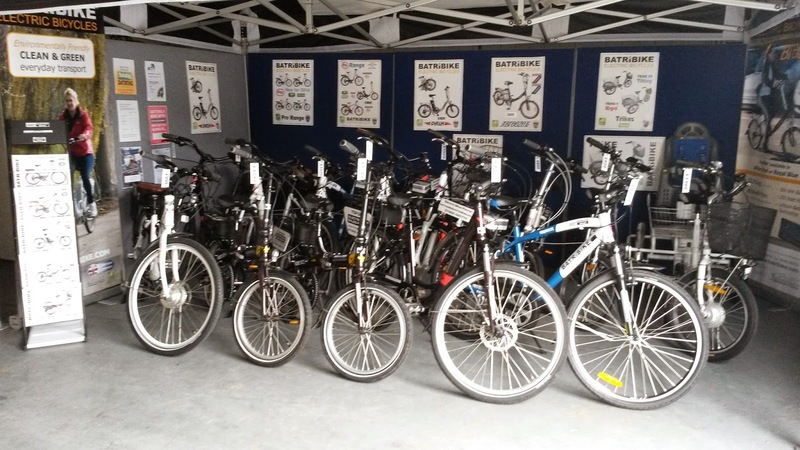 Customers can collect a bike from one location and drop it of at one of the other official hire stations. The award was presented by Scottish actress Laura Main who is well known for riding a bicycle in the popular TV series "Call the Midwife". 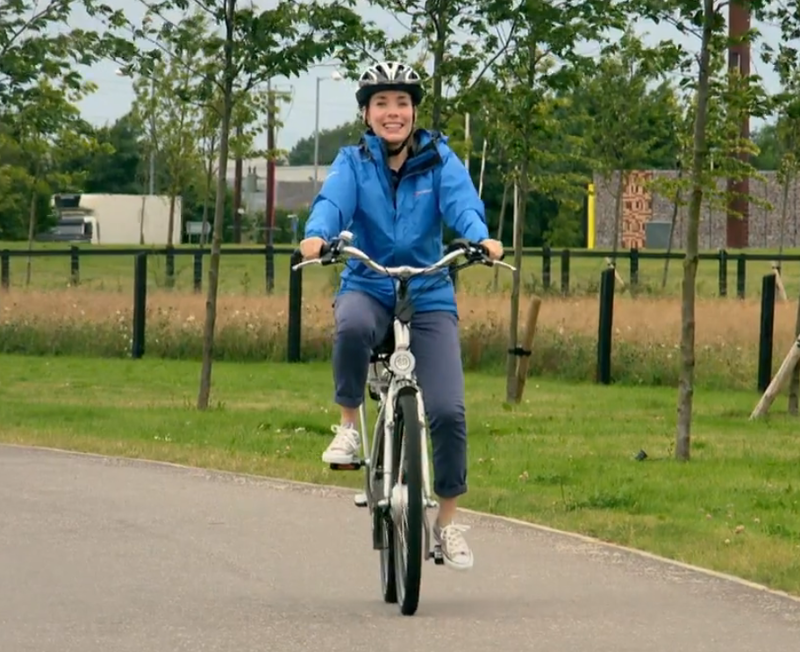 Laura was seen riding a Batribike Diamond through the Helix park. Well done and congratulations to the Helix and to Gordon of Easygo Electric Bikes for the award. Kielder Water in Northumberland is a man-made reservoir which has a multi-user track that stretches 26.5 miles all the way round. On Friday I had the amazing opportunity to ride the Batribike Diamond Pro electric bike on that track. The weather was overcast as we arrived at the Tower Knowe Visitor Centre and car park just below the dam on the southern shore. We packed our cameras, waterproofs, bottled water and apples, to sustain us on the adventure, and set off. We had decided to take the clockwise route, starting on the shady side and saving the sunny northern shore for the return journey. I was immediately impressed with the surface and width of the track. My research had shown that it is suitable for cyclists, walkers and wheelchairs and I would definitely agree. The track does occasionally meet a road but apart from car park areas we did not share any part with road traffic – it was a very safe route for all. We started along the waterside and then headed into the trees. The route was very well way-marked and the handy little map that we picked up in the visitor centre told us where to find sculptures and other points of interest around the route. Some of the roads that we met showed a different history of the area, before it was a reservoir. There were also new bridges to carry the route round. This curved suspension bridge was a lovely sight as we came out of the trees. Kielder Water itself was obviously the star of the show and we had some lovely views as we rode round. This wooden head had stairs inside so you could climb to the first floor and look out of the eyes! I had assumed that the route would be fairly level as it is a waterside route, but actually it is quite undulating with some quick ascents and descents. The Diamond Pro took them all in its stride, I did have to increase to max power and drop down the gears for the steepest ones but this was not a problem. I was very impressed with its performance. We were about two thirds of the way round when we me a lady coming the other way on a Batribike Diamond LCD. We said hello and how are you doing. She said that she was very pleased that since getting her Diamond she rides further than she did before. We soon reached some giant reclining chairs and stopped in the sunshine to eat our apples. The open stretches of track were bounded by heather, Willowherb and waving grasses and were full of Finches that rose like swarms of butterflies and fluttered along in front of us. We finished the ride across the dam and back to the car park as the skies became a little darker. A great day out and a good workout for the bikes. Yesterday the alarm went off at 3.00 am. It was time to get up and head into London! Batribike had once again been invited to demonstrate electric bikes in Green Park for the RideLondon Free Cycle event. It was still dark as we drove along the Embankment and I used my phone to get a quick picture of the London Eye all lit up. Then onward down the Mall in the dark as the barriers went up. We arrived at the BEBA electric bike test area and unloaded, as it began to get light we got set up and ready for the day. We were in a different part of the park this year but the designated test ride area certainly meant that lots more people came to have a try out and see what electric bikes were all about. Once again I took the opportunity to ride the FreeCycle route. The Mall looked different in the daylight and it was nice to be out riding the Batribike Diamond Pro. This time it wasn't just the taking part that was on my mind. I really wanted to see the WW1 memorial poppies at the Tower of London. The Tower is the turning point for the ride where the cyclists sweep round a U-Turn bend. It was quite crowded here and I edged across to the side of the road and dismounted onto the pavement. Everyone wanted to see the poppies and the pavement was crowded with tourists and cyclists trying to catch a glimpse of the sea of red ceramic poppies that form the start of this major art installation Bloodswept Lands and Seas of Red. I got my bike across to the railings and peered across the greenery for my first look. Wow! It was breath taking, and emotional too. I wheeled my bike through the crowds to get to a lower level for a better view. I was going against the flow of tourists who seemed bemused by the sheer numbers of cyclists pushing their bikes. The poppies are amazing. 888,246 of them are being ‘planted’ by volunteers. Each one represents a British or Colonial military fatality from the First World War. All the poppies will be in place and the moat filled by Armistice Day on November the 11th. The roof of the White Tower is black, so the view from above will be of one immense memorial poppy. It was time to complete the ride and I headed back to Green Park. There were certainly lots of happy ‘electric smiles’ as visitors tried out the various bikes. Finally it was time to pack up and head home. We left the park at 8.00 pm just fifteen hours after we had arrived, but what a great day, we thoroughly enjoyed our time in London.